Creating a history timeline is a fabulous way to connect historical events. But when should you make one? How do you get started? What kind should you make? It's easy to get overwhelmed before you even begin! Today, let's take a look at each step in the timeline-making process. We'll take a look at why you and your children should keep a history timeline, the different types of timelines (yes, there is more than one way to make a history timeline! ), when you should use each type, and how we're using timelines during middle school. Let's start with the basics - why would you even want to make a history timeline? Why create a history timeline? This post has been sponsored by Home School in the Woods (and it includes affiliate links). Historical events can often seem isolated - especially if you’re just focusing on one event during your history lessons. When you move on to another topic it can be difficult to understand how different historical events affect each other. That’s where a history timeline comes in. Recording important dates and topics in a timeline format is an easy hands-on way for children to connect-the-dots between various historical events. When adding new notations, they will notice that events in other countries are taking place at the same time. It’s a wonderful springboard for discussions about how various historical topics are connected. Now that you know why you should add a history timeline to your history studies, how exactly are you going to make one? There are many kinds of history timelines but the three explained below are the most common. You'll also find some helpful links that will show you different ways you can use these types of timelines (and ideas for more kinds!). Each one has its own advantages and drawbacks so it will be up to you to decide which one will best suit your homeschool needs. A timeline notebook is simply a notebook or 3-ring binder with pages for recording historical events. It can be as simple as plain paper in a binder or printed timeline pages for recording all the details and information. This type of timeline is perfect for almost every homeschool. If you have more than one child, each child can make their own, personalizing it as they work through historical events. Notebooks don’t take up much space - you’ll just need a spot on your homeschool bookshelf. The one drawback is that it’s a little bit harder to see the span of historical events since you'll have to flip pages to see everything. This is our preferred method since it doesn't take much space and everyone can personalize their own (even mom!) notebook. After looking at a few different options we decided to use the 'Record of Time' timeline notebook from Home School in the Woods and it was a perfect choice! The notebook is high-quality with a lovely cover and pre-printed dates and lines on heavy cardstock pages (it makes a wonderful homeschool keep-sake). If you have a child that prefers to write, there are plenty of lines to keep everything neat and tidy. We prefer to use timeline figures and the set from Home School in the Woods is lovely with detailed drawings and information for each figure. Just like it sounds, a wall timeline is simply a timeline adhered to the wall. It can be a long sheet of paper, a string with clips, or anything that you can think of - as long as it's on the wall! Wall Timelines work well for those who really want to see everything all at once. It's a wonderful visual for seeing how historical events are connected. The major drawback is that it takes up quite a bit of wall space, and if you don’t have a dedicated homeschool space, you may be looking at your timeline during dinner (which can be a great conversation starter with dinner guests!). Since it takes up so much room, if you have more than one child, it’s also difficult for each child to have their own timeline (unless you have lots of free wall space). Since our house is small and we have limited wall space (lots of book shelves here! ), we use wall timelines sparingly. But we still use them! They are perfect for short-term studies or for a specific topic or time period (like an overview of scientific history in the timeline pictured below). If you want to use a timeline for little ones, I love this idea for making a reusable timeline - great for little ones who want to adjust their timeline figures. A string & clothespin timeline is also a great space-saving choice. A fold-out notebook timeline takes the best of both of the previous types - like a wall timeline, it's a long timeline (usually some pages taped together to make a longer sheet) but it's folded and 3-hole punched to fit inside a notebook. A fold-out notebook timeline can easily be stored in a binder but pulled out to see the full span of events - giving you the benefit of neat storage while still getting a clear picture of interconnected historical events. The drawback is that it would have to be a very long, unwieldy timeline to cover a large historical time period. It works well for shorter, focused studies on a particular topic or time period. We use these types of timelines for focused studies when we're also creating a history notebook. We've made one for composers, another for artists, and a few for short-term historical studies. They fold up nicely right inside our history notebooks. The three options above are the most used methods, but there are some variations and a few more fun ideas you can use to make a timeline. You can make paint stick timelines for short-term studies that are focused on a specific topic. Use a trifold board if you like the idea of a wall timeline but have limited space. If you prefer individual cards for each historical event, you can store them chronologically in an index card box. The Giant American History Timeline is an innovative way to create timelines - with completed activity pages. Which timeline should you choose? 1. Is it a long-term or short-term study? Your first step is to decide which timeline method will work best for your family and your study. Is it a short-term, focused study? You may want a wall timeline or fold-out notebook timeline. Working on a long span of historical events? A notebook timeline will probably be your best option (especially if you have more than one child and each one wants to keep their own timeline). We’ve used all three of these methods at different points and the notebook is by far our favorite for a long-term history study. For shorter studies, we like the fold-out notebook timelines but our everyday go-to history timeline (especially for year-long or multiple year studies) is the notebook timeline. 2. How will you record the information? Once you’ve chosen the type of timeline that works best for your family and then you can decide how your children will record the information they learn. You can just have your children write significant dates and events directly on the pages of their timeline but we like to include images for interest and variety. My daughter LOVES the timeline figures from Home School in the Woods. They are wonderfully detailed and memorable (and the images are great for kids who like including visual elements in their timeline). As they get familiar with the faces of famous individuals, when they see their picture somewhere else, they easily recognize them (believe me, when that happens, it makes me feel like a smart teacher!). Once you’ve decided on your basic method, it’s just a matter of including a few minutes during your weekly history lessons to work on the timeline. If your kids are older (middle school or high school) they can work on this independently. I prefer to be a little bit hands-off so the timeline really becomes the child’s - something they’ve created themselves. During your history time, have your children note any interesting person or historical event - they can write the information directly onto their timeline or use a timeline figure to showcase the event or person. This is a perfect project to work on while you're reading aloud from your history book or historical literature selections. The best part? Once you’ve set up your timeline it’s simple to have your kids work on their timeline for a few minutes each week. Over the years, it will become a resource they can refer to over and over again and it becomes a wonderful keepsake of all their learning. Looking for more timeline tips? Home School in the Woods has a section dedicated to timeline helps. Now that my daughter is in middle school she works on her timeline independently. We're covering the span of history in a 4-year sequence so a notebook timeline works well for our long-term study. Here’s how it looks for us - once a week she uses her history text and an encyclopedia to find the most important dates for whatever historical event or person she’s studying that week. She looks through her folder of timeline figures to find the most relevant and adheres them in the appropriate place on her timeline. 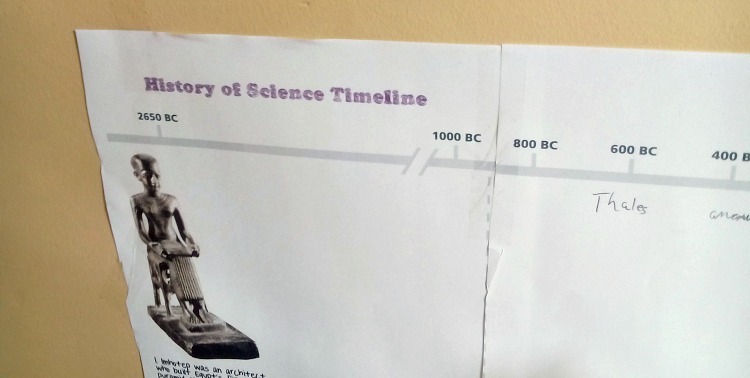 (One tip: print the timeline figures on sticker paper for quick and easy use. Just cut, peel off the backing, and adhere - no messy glue needed!) If she notes that important dates or events don’t include an image she’ll record the details of the event on the timeline. While we use one history notebook for the bulk of our studies, we've also used a few fold-out timelines and a wall timeline for short-term studies each year. Each of these is stored with any notebooks or related projects for the year. How do you use timelines? Are you and your kids using timelines for history or other subjects? I'd love to hear about your favorite resources - leave me a comment and share your tips! And, to learn more about my favorite timeline resources, head to Home School in the Woods and take a look at their wonderful timeline resources. You won't be disappointed (I promise! ).